TONGE, Seth: Brief biographical details and a photograph which is likely to be him taken in India. I was given this photograph (below) by my grandmother. She said that it had been up on the wall at her parents house when she was a girl. She recalled her parents telling her that it was a member of the Tonge family, a relative of her father's mother (Margaret Tonge) but she didn't know who. 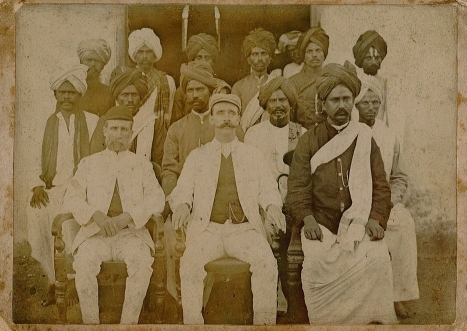 Probably, judging from the subjects and their attire, it was taken in India between 1890 and 1910. Not knowing who the photo was of, it sat in a box in the garage for ten years, until I found records of Seth Tonge, Margaret's brother Seth arriving in London from Bombay on board the Nagoya in 1918. SETH TONGE was born in 1859, the second child of Robert and Patience Tonge. He was bought up in the Heaton and Halliwell areas of Bolton. By his early twenties, he was was working as a "Stripper and Grinder" in a cotton mill. He married Jane Hampson in 1881, who gave birth to three daughters Sevina, Bertha and Elizabeth, before the family moved to Paisley Abbey, Renfrewshire in Scotland, where Seth was employed as a foreman in a cotton mill. Here they had another daughter, named Lizzie. We start to find records of "Mrs. Tonge" travelling from Bombay to London in 1900, so presumably Seth had moved to India some time before this. We find her travelling from Bombay to Plymouth again in 1907, Karachi to Liverpool in 1910 (accompanied by Miss Tonge), Calcutta to London in 1913 (again accompanied by Miss Tonge), and Bombay to Plymouth in 1914. Seth himself came back on 27 Feb 1918 on board the Nagoya, from Bombay to London. He is listed in the ship records with an occupation of Mill Manager. He died four months later, at 72 Worsley Road, Farnworth, and was buried at St. James, New Bury, Farnworth. His widow Jane was shown as a "Shopkeeper (grocer)" on the 1901 census, living on her own means, with her daughter Sevina also working on the shop. Jane died in 1927 and was buried at New Bury with her husband. Their daughters continued to live at 72 Worsley Road; Sevina died in 1936 and Edith in 1947. So which of the two men in the photo is Seth? Lets state the obvious first; he's not one of the guys wearing turbans. No, more than likely, he's one of the white chaps sporting the splendidly bushy facial hair. I would guess that, the man on left with the mutton chops beard, is the elder of the two - maybe 30 to 40 years old. The other man with the handlebar moustache is probably slightly younger - maybe 25 to 30. 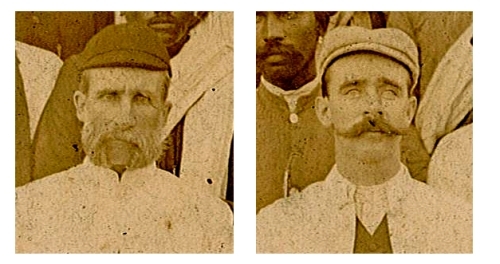 If we guess that the photo was taken around 1900 (Seth was in India from at least 1900, and probably earlier, until 1918), then the older man on the left fits best as Seth.